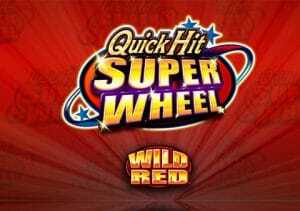 And the award for the biggest tongue twister name for a video slot 2018 goes to … Quick Hit Super Wheel Wild Red. It’s part of Bally’s popular series that combines fruit machines with wheel bonuses. They can deliver instant prizes, multiplier awards and free spins with multipliers or extra wilds added on each of them. Play on all devices from between 40p and £50 per spin. The design here is simple but nicely done. The reels have the look of a classic fruity. There you’ll find cherries, bells, bars and single, double and treble 7s. Those treble 7s are the most lucrative. Land 5 of them in the same payline and you’ll win a payout of 50 times your bet. Those same amounts are on offer from the Wild Red symbol. This replaces everything apart from the bonus and scatter symbols. Land 3 or more of those scatters on the same spin and you’ll trigger a Quick Hit Scatter payout. Land 5 or more of them and you’ll win a jackpot prize. The amounts on offer are shown in the meter in the top right corner of the screen and can reach a whopping 1,500 times your total bet. X Pays feature – Spin the inner wheel. The pointer will land on a segment that awards a multiplier of between 3x and 25x. The bonus symbols from the triggering spin then turn into wilds and a new payout calculation is made. Whatever you win is boosted by the multiplier. Quick Hit feature – the inner wheel spin here will deliver a number of scatters which in turn deliver a Quick Hit Jackpot payout of up to 1,500 times your bet. Free Games Bonus feature – after receiving a payout of 1x your total bet, you’ll spin the wheel. This will award between 8 and 20 free spins. The wheel spins on each of those free spins. Depending on where the pointer lands, your payout will get a 2x, 3x or 5x multiplier boost. Wild Free Games feature – a 1x payout is made and between 8 and 20 free spins awarded. Instead of multipliers, the inner wheel brings extra wilds into play. On each free spin, you could see 5, 10, 15 or 20 extra wilds spinning around the reels. If any of them do hit, they be frozen in position for the remainder of the round. We enjoyed Quick Hit Super Wheel Wild Red much more than we expected. There are elements of an old school fruity here but the wheel bonus features deliver more than enough variety to keep things interesting. Quick Hit Super Wheel Wild Red might be something of a mouthful. If you’re looking for a classic fruit machine with some tasty extras thrown in, then it’s certainly one to consider. If you want something more modern, you cannot go wrong with Bally’s Monopoly Millionaire.